ScienceDaily (Feb. 21, 2009) — Peroxisomes, multifaceted functional units within cells, fulfil the most diverse of tasks. In human beings, failure of these organelles is fatal. Their biogenesis does not adhere to the standard rules and still remains to be fully clarified. Scientists from the research team under the auspices of Prof. Ralf Erdmann and Dr. Hanspeter Rottensteiner (Department of Systemic Biochemistry, Medical Faculty at the Ruhr University) have identified a new pathway for components of the peroxisomal membrane proteins. The data gained is a significant contribution towards the comprehension of the formation and origin of peroxisomes. Peroxisomes are organelles responsible for a multitude of metabolic functions within cells. They contain over 50 different functional enzymes capable of forming highly variable structures adapted to the specific needs of the organism. One of the most important features of peroxisomes is the spatial isolation (compartmentalization) of metabolic pathways in which poisonous hydrogen peroxide is formed. Its destruction thereof is one of the most important functions of the peroxisomes. 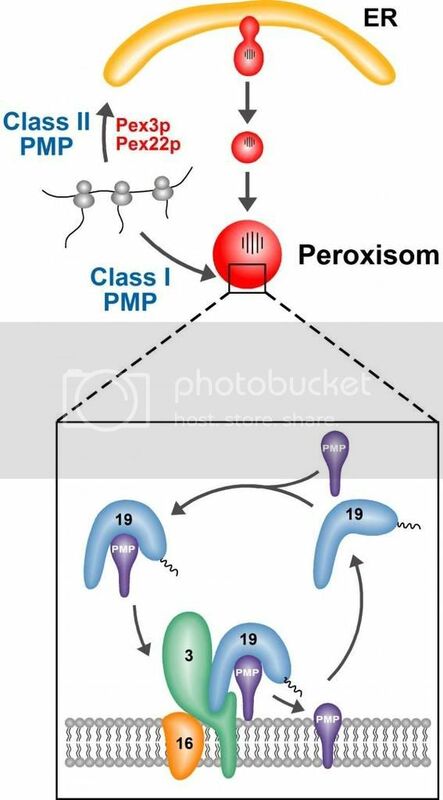 Type 1 peroxisomal membrane proteins (PMPs) are synthesized on free ribosomes within the cytosol and bound to the peroxisomal membrane immediately after formation. By contrast, the Type 2 PMPs, which, according to the data gained in this study, include Pex3p and Pex22p, are initially transported to the endoplasmic reticulum and only subsequently to the peroxisomes. Prof. Erdmann explained that the significance of these organelles is illustrated by the illnesses of patients suffering from defects in individual enzymes or a disorder in the biogenesis of the peroxisomes. Illnesses resulting from a biogenetic disorder are subsumed as the Zellweger spectrum and are usually so severe that the patients die during infancy. Clarification of the biogenesis of these organelles is essential for the development of approaches for diagnosis and treatment of these diseases. The research team at the RUB investigated – amongst other things – the origin and biogenesis of the peroxisomal membranes. Prof. Erdmann explained that the peroxisomal protein import machinery has to be assembled before the peroxisome can import the numerous enzymes required. The Pex3p protein is a decisive factor for importing membrane proteins, functioning as docking site on the membrane. These docking sites enable targeted insertion of newly formed proteins. To date, it has still not been fully clarified how Pex3p per se is integrated into the membrane. It could, however, be shown that newly formed Pex3p is initially incorporated in the cellular fluid of the endoplasmic reticulum (ER, another cell organelle). The subsequent mode of transport of Pex3p to the peroxisomes is still unknown. Prof. Erdmann stated that there is a significant difference between this pathway and that of other peroxisomal membrane proteins. The latter are incorporated directly into existent peroxisomes and require Pex3p for this procedure. To date it has been assumed that Pex3p is the only peroxisomal protein that reaches the peroxisomes via the endoplasmic reticulum. The scientists at the RUB have now been able to prove that this is not the case. They compared the import pathways of Pex3p with those of Pex22p, another peroxisomal membrane protein, and were able to demonstrate that in each case a small fraction of these proteins already suffices to transport a fluorescent reporter protein to the peroxisomes. The segments of the protein that target a specific site are termed signal sequences. The similarity between Pex3p and Pex22p signal sequences induced the scientists to exchange the two parts using molecular biological techniques and to subsequently investigate the functionality of the two thus altered proteins. Their analyses disclosed that the signal sequences of the two proteins are interchangeable without affecting their peroxisomal targeting. Further investigations showed that both proteins use the same pathway. This implies that this pathway is not exclusively used by Pex3p (as assumed to date) but rather constitutes a newly identified general pathway for peroxisomal membrane proteins. Moreover, this study showed that the Pex3p-signal sequence is responsible for targeting, but not - in contrast to the generally accepted opinion - for the specific function of Pex3p in the biogenesis of the peroxisomes.